In preparation for a somewhat complicated painting, I whipped out my sketchbook and got down to some serious doodling. This one's going to (in theory) be on different layers of paper, perhaps even different kinds of paper! 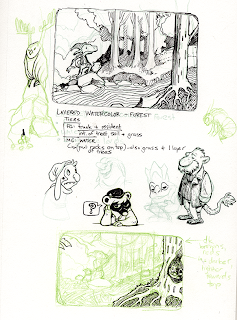 Pictured here are the sketches for the layout, with some notes on the layering, and some unrelated doodles of critters and an outlandish rock carving. An owl with antlers? BALDERDASH AND POPPYCOCK! 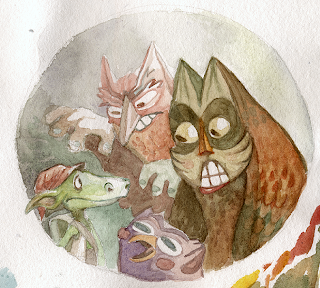 Finally, here's a quick painting I did last night while mulling over some designs for bird-monsters. I did it a bit too hurriedly and so the color is muddy in some places and just plain weird looking in others, but overall I'm happy with it as an experiment of sorts.